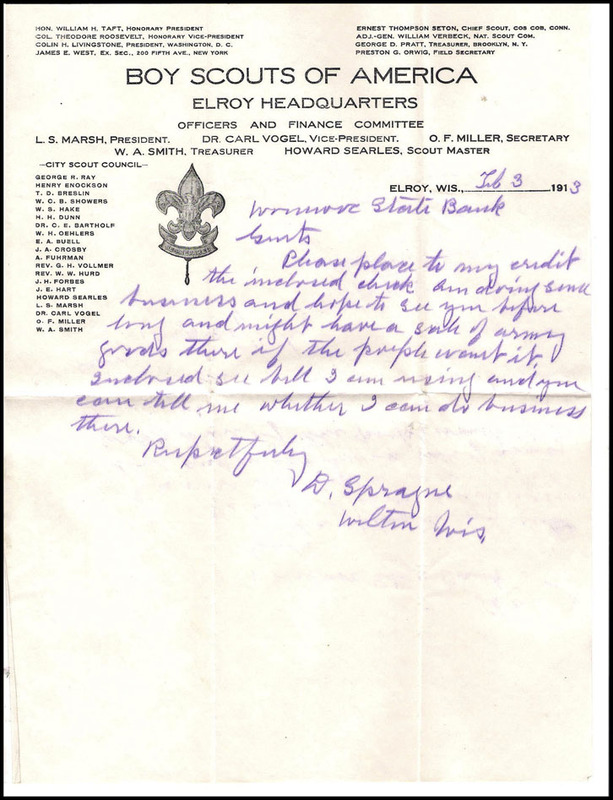 Copyright © 2010 - 2017 by Scouts on Stamps Society International, Inc. All rights reserved. b. 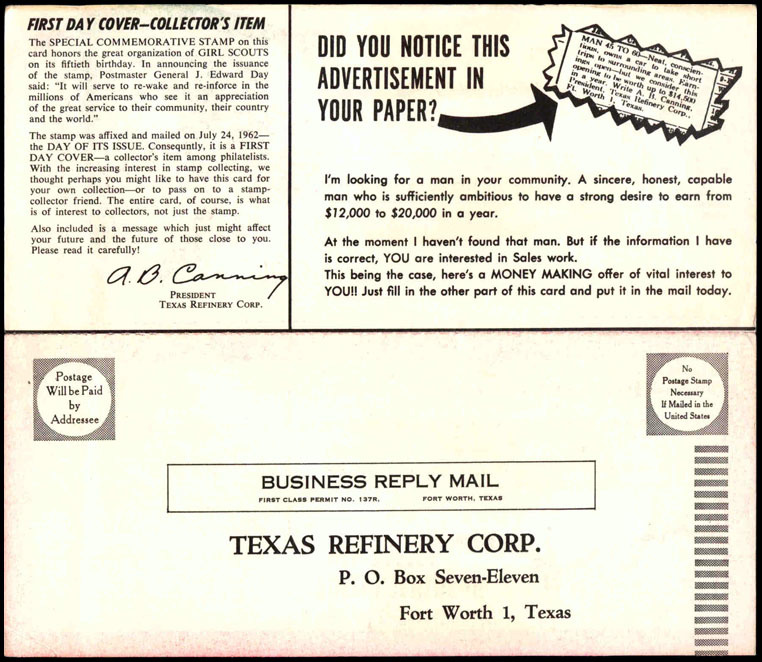 Cachet corner card covers in the Levy Cachet Cover Print Catalog. 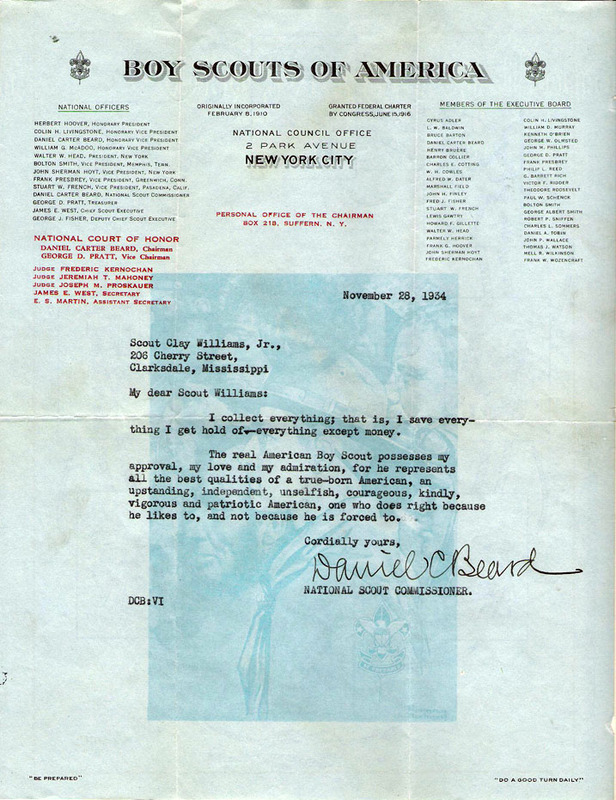 The envelopes - or covers - they came in are referenced. they were mailed in also are collectable covers. of material of historical interest that can be found, sometimes surprisingly, inside covers. 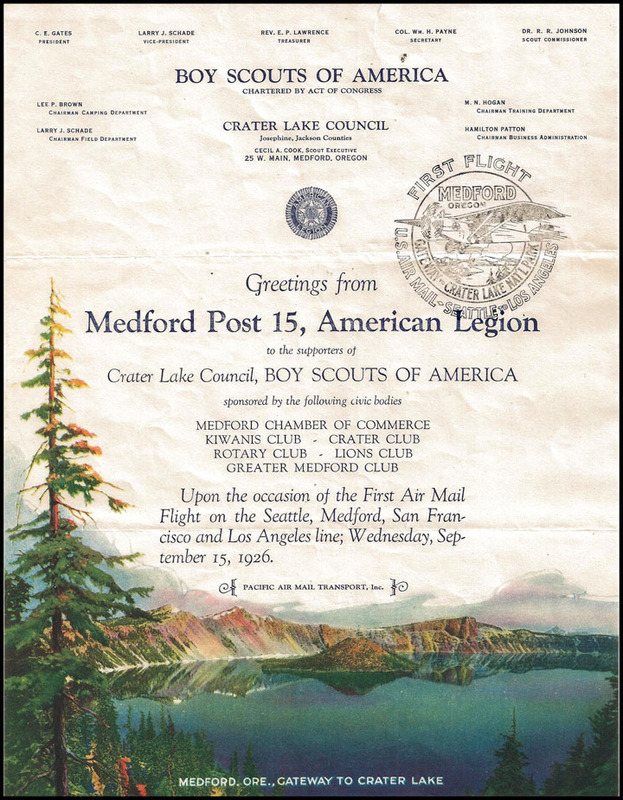 Mailed in 1913 cover. See 13-1 in "Additions", 1910s Decade. came later. 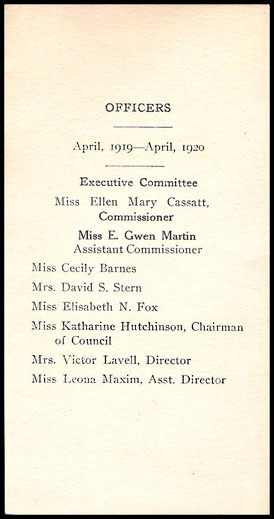 The first Council in Wisconsin wasn't organized until 1915. Black on 8½" x 11" sheet. 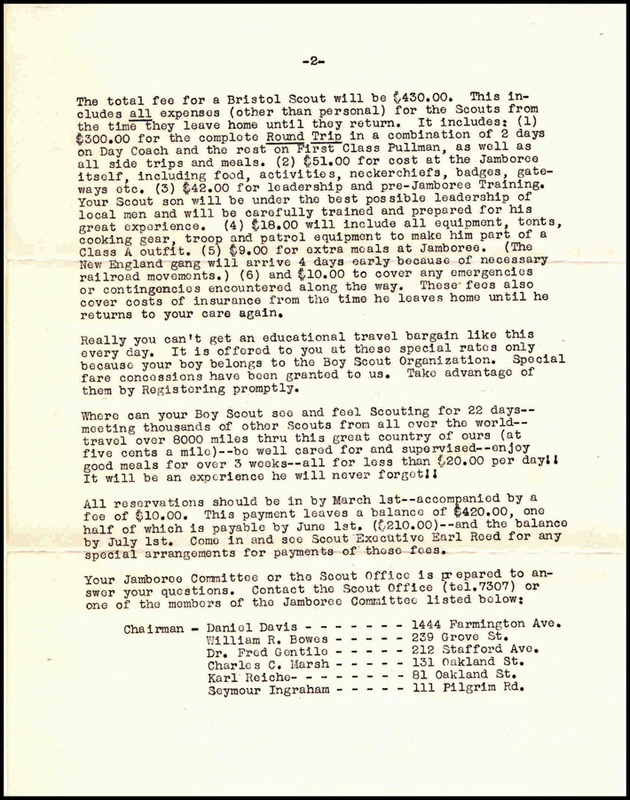 Typed on National Council stationery Black on 8½" x 11" sheet. Cnc. 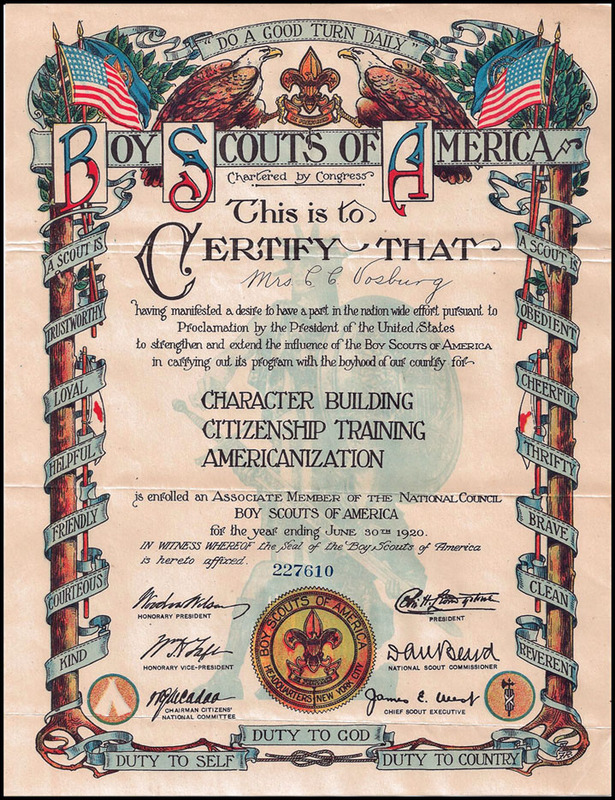 National Council, BSA Corner Cards. Printed Black on 8½" x 11" sheet. Refer to 17-3 in the "Additions" section. Printed Blue on blue 8½" x 11" sheet typed in violet. 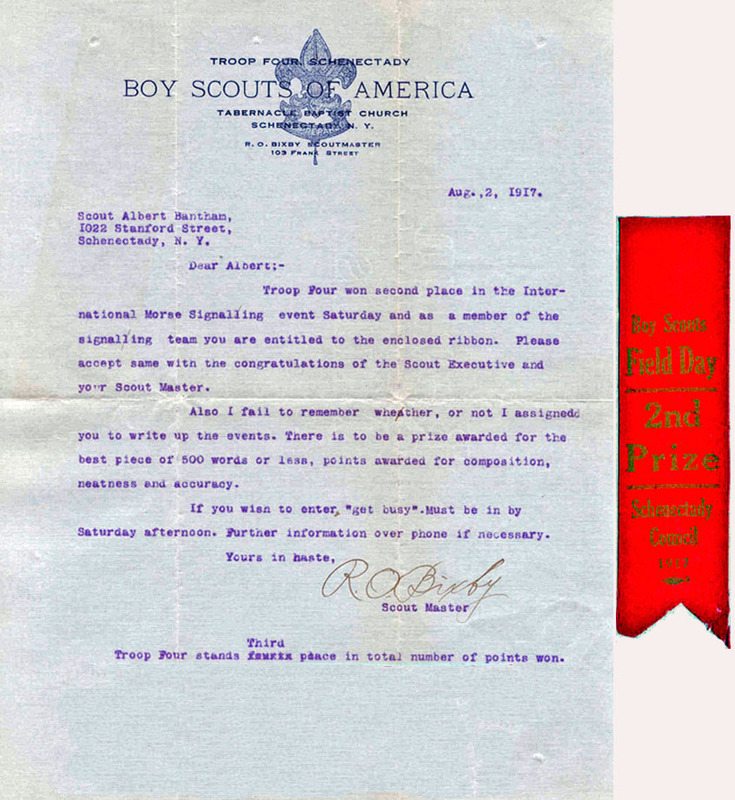 Mailed in 1919 Boy Scout Week Cover. See 19-1 in the Print Catalog. Printed Multicolored on 8⅜" x 11" sheet. 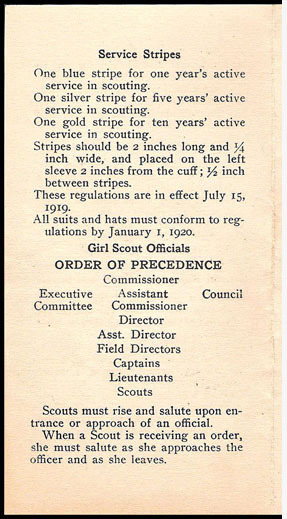 Refer to the 1919 Girl Scouts of Philadelphia cover in the Corner Cards section. The four page "Regulations" is a 6" x 6⅜" sheet folded in half. 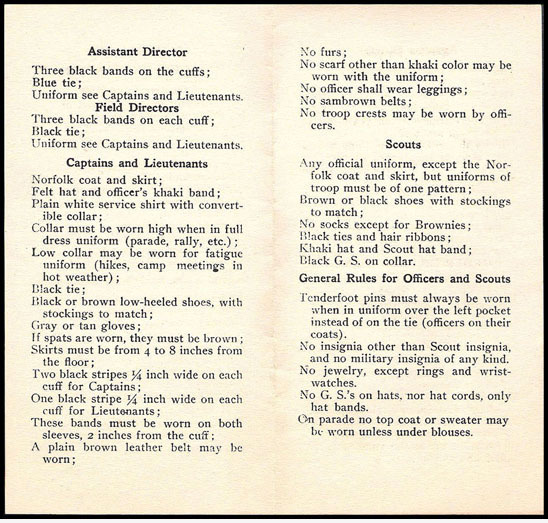 The "Officers" sheet is 6" x 3". Enclosure in 25-4. See 25-4 in "Additions", 1920s Decade. 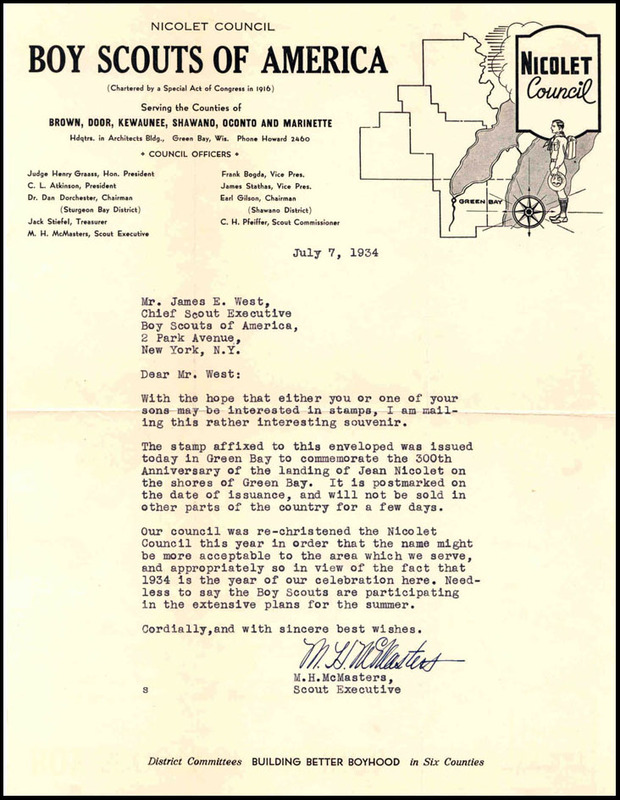 Typed Stationery Iron Range Area Council, Iron Mountain, MI. 5,000 printed February 1926 as indicated in the upper left corner. 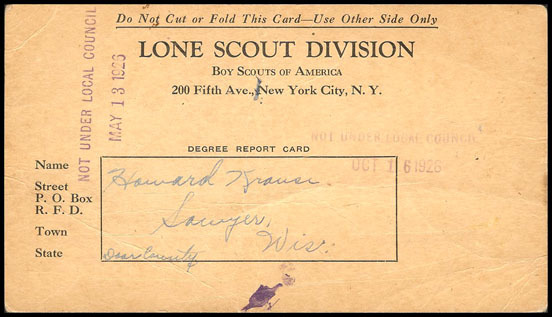 Refer to the 1926 Lone Scout Division cover in the Corner Cards section. as stated in the side bar story on pages 10 & 11 of the Print Catalog. Multicolored with Black Rubber stamped First Flight cachet. See 27-0.1 in "Additions", 1920s Decade. 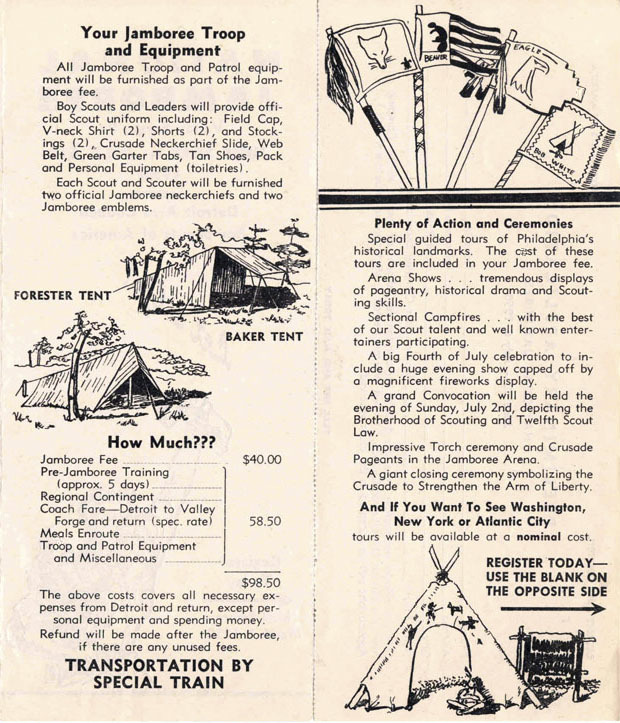 Enrollment, Rates, What to Take to Camp Yawgoog. Printed black 8½" x 11"sheet. Sheet was folded in thirds and mailed. Refer to 28-0.1 in the "Additions" Section, 1920s Decade. Green on green 6" x 9½" sheet. 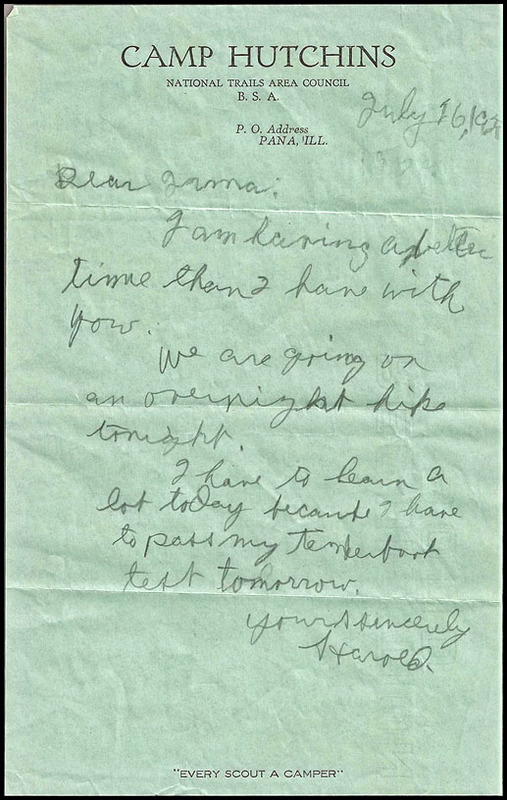 "Dear Irma, I am having a better time than I have with you...." Irma probably was Harold's sister. See 29-3 in "Additions", 1920s Decade. 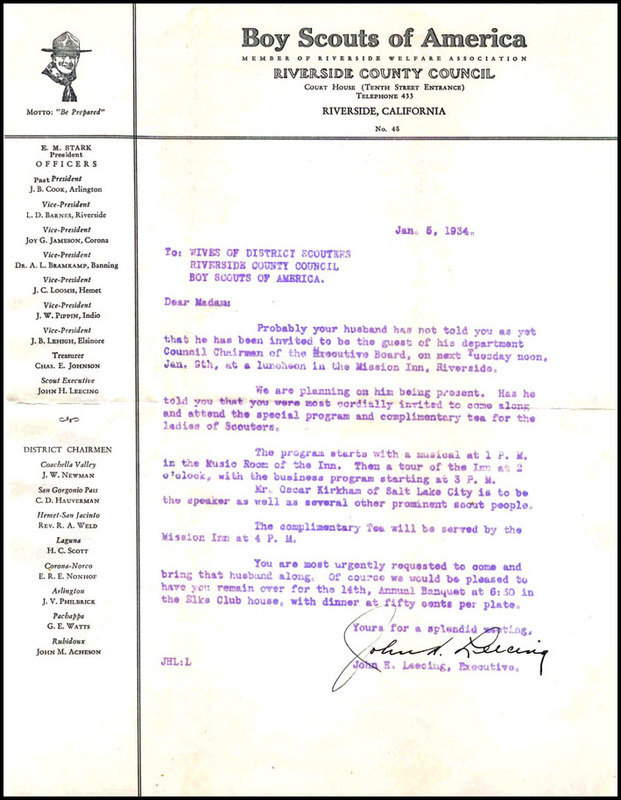 Refer to the 01/07/34 cover addressed to Mrs. Guy Bogart in the Corner Cards section. Mimeographed in violet on Council stationery. The 4 p.m. tea was complimentary. Dinner was fifty cents. Typed on Council Stationery. Evidentally West took the Scout Executive's advice and gave the cover to his son. 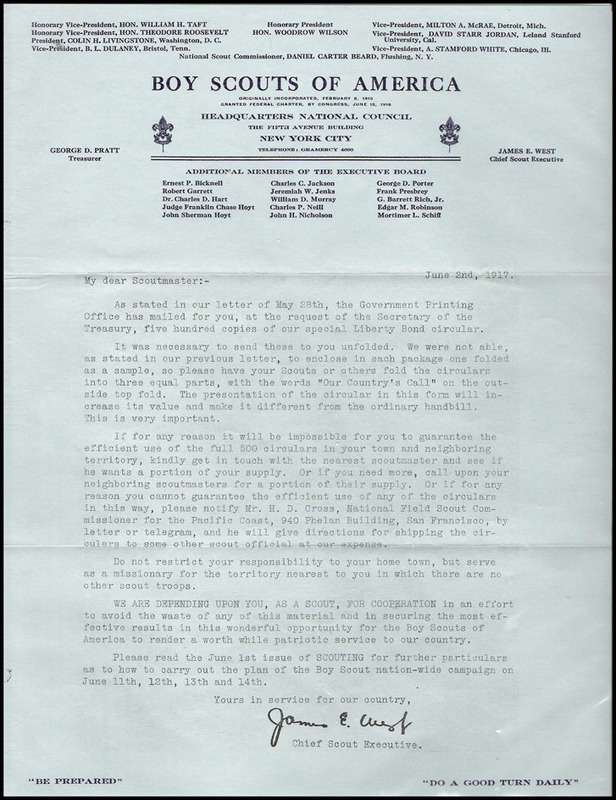 Refer to 34-3.4d in the "Additions" Section, the cover in which this letter was mailed. This is the stationery that Beard used as Chairman of the National Court of Honor. Red overprint on black & blue National Council stationery. 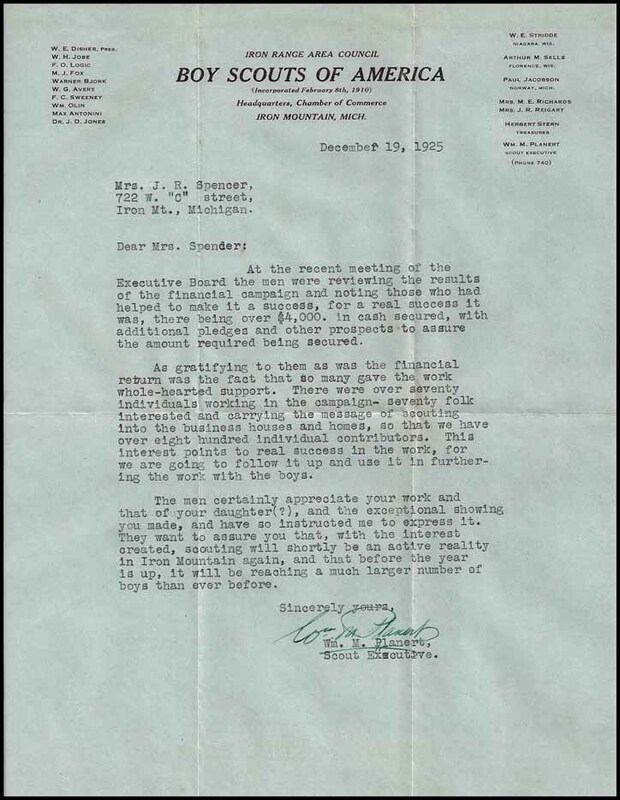 11/15/35 Letter from Philippine Council, Manila, P.I. 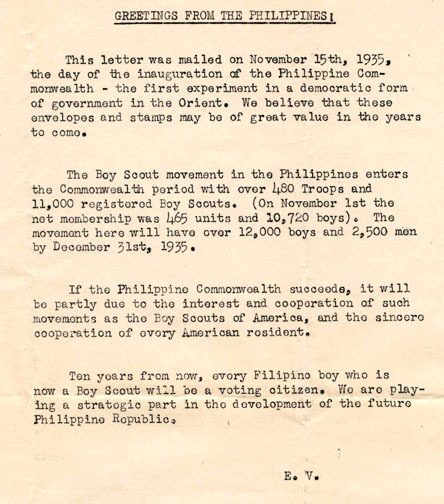 Refer to the 1935 Philippine Council cover in the Corner Cards section. Mimeographed in black on plain 8½" x 11" sheet. 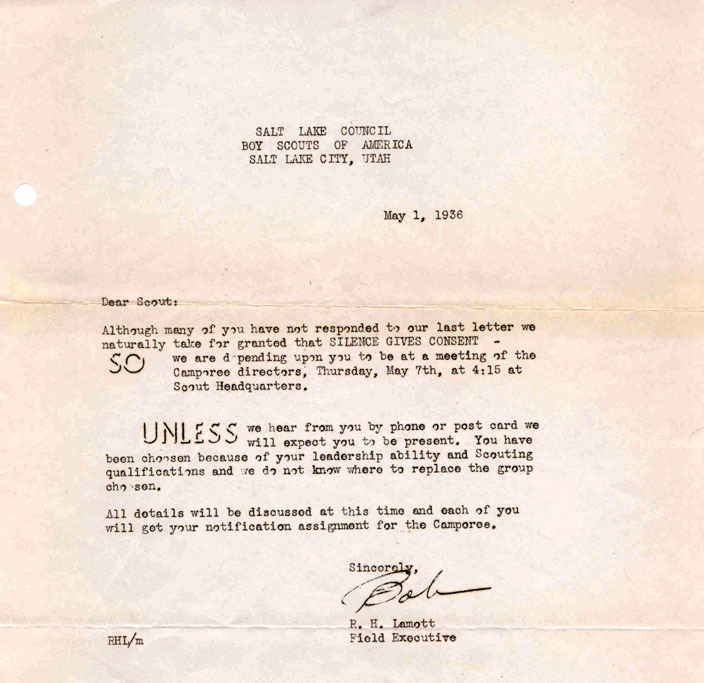 Only the printed portion is shown. Refer to 36-4.2a in the "Additions" Section. Mimeographed in black on pale green 8½" x 11" sheet. 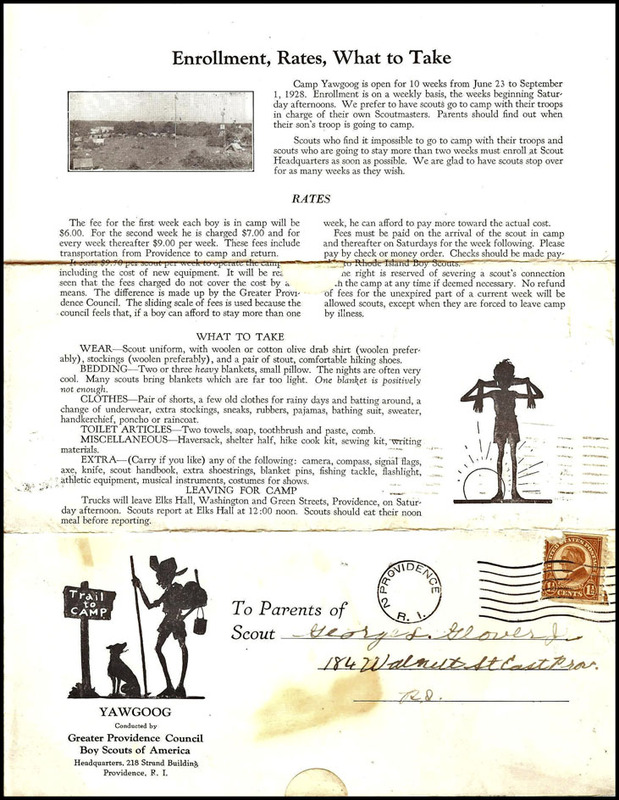 Mailed in #39-6a (See the Print Catalog), the first day of the first Sea Scout cover. Peatfield was the Cachet Director for the iconic 31 cachet series issued over a three year period. The 1939 Annual Long Cruise was referred to in the cachets as the "New York World's Fair Cruise". Mimeographed in black on 8½" x 11" sheet. of the United States. 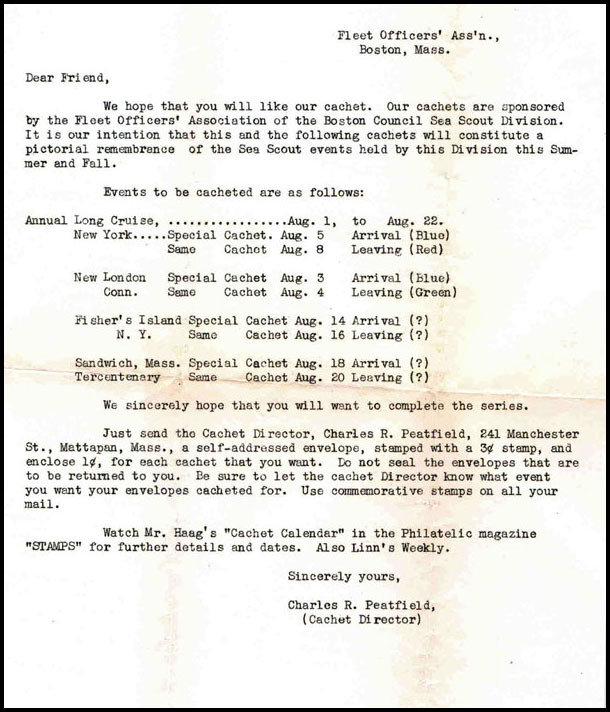 Levy cataloged cachets, not covers. Refer to "Additions", 48-3.1 in 1940s decade. Typed in black on 8½" x 11" sheet. 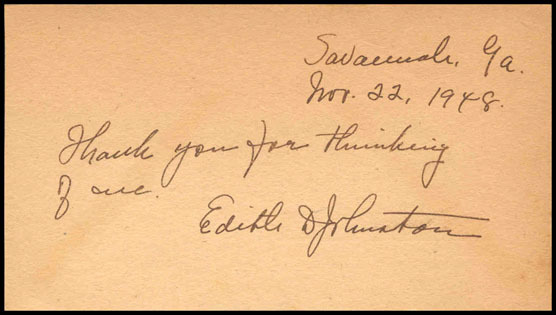 11/22/48 autograph note from Edith D Johnston, Savannah, Ga. 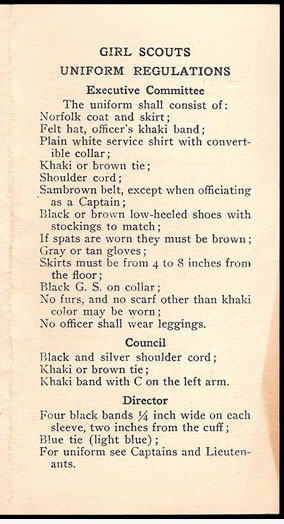 Refer to 48FD-98 in the "Additions" Section, 1940s Decade. 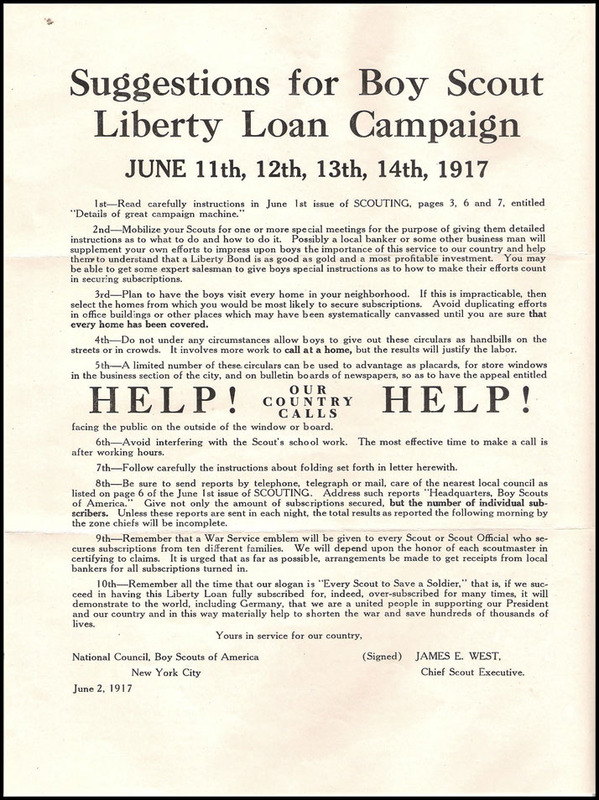 June 1, 1913 to June 1, 1914. 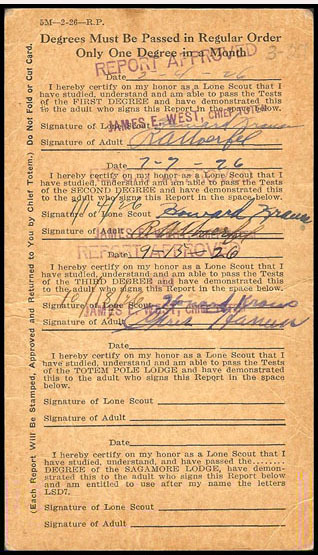 Handwritten in ink on manila filler card. 5 panels are shown here. 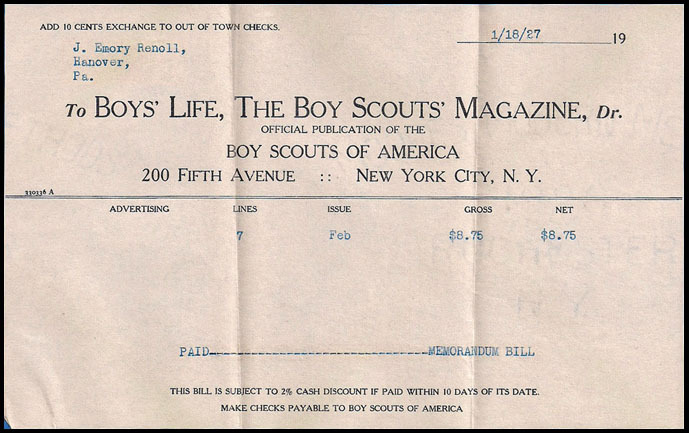 See the cover, 50-.02 in the Additions Section. 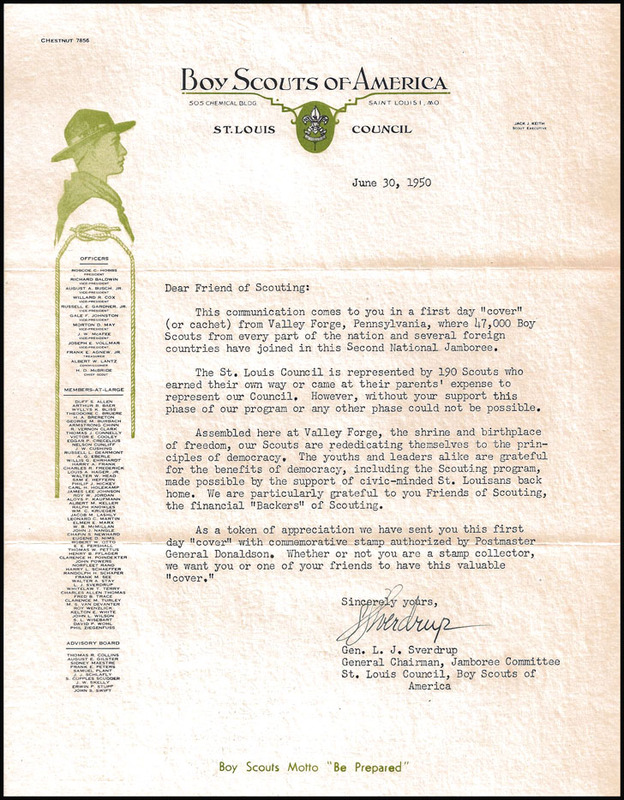 06/30/50 Letter from the St. Louis Council to their "Friends of Scouting"
Refer to 50FD-3a in the "Additions" Section, 1950s Decade. 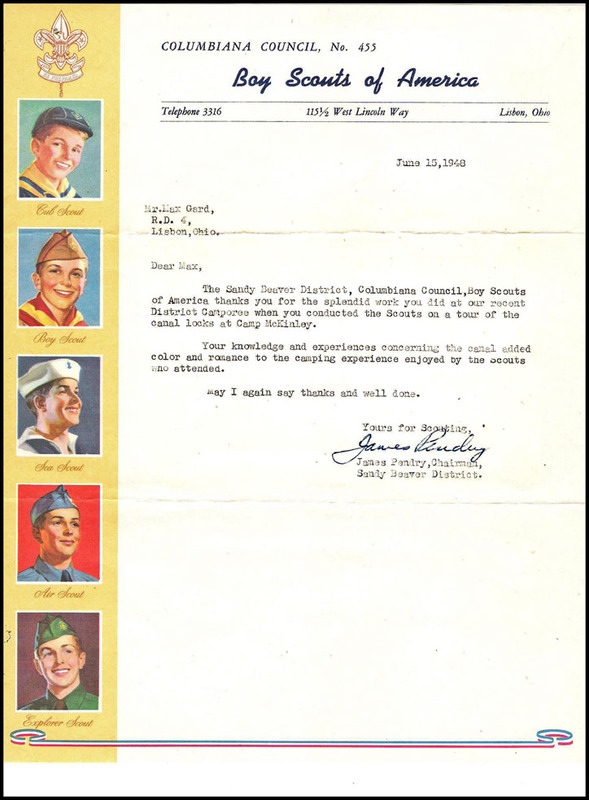 Letter was sent in a FDC from the National Jamboree. Refer to 50FD-3b in the "Additions" Section, 1950s Decade. 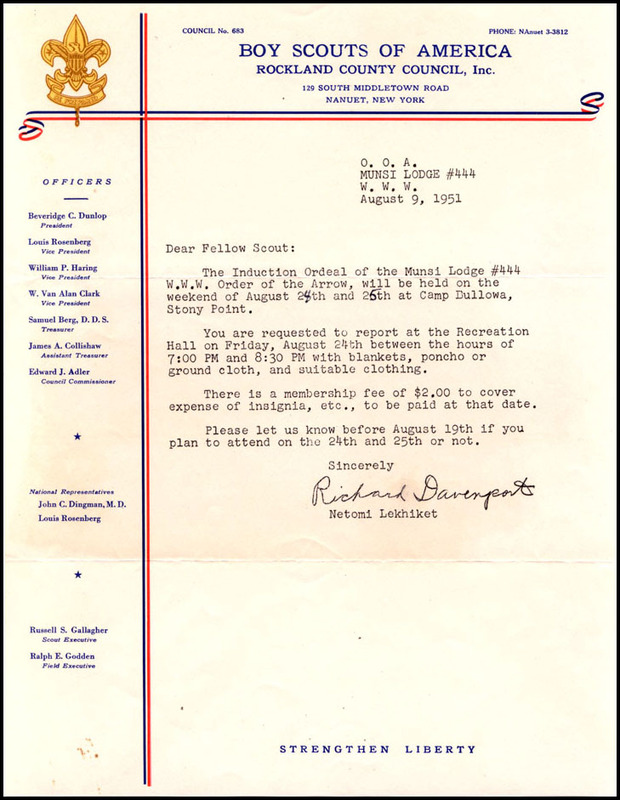 08/09/51 Letter From Rockland County Council, Munsi Lodge 444 W.W.W. Refer to 51-0.3 in the "Additions" Section, 1950s Decade. 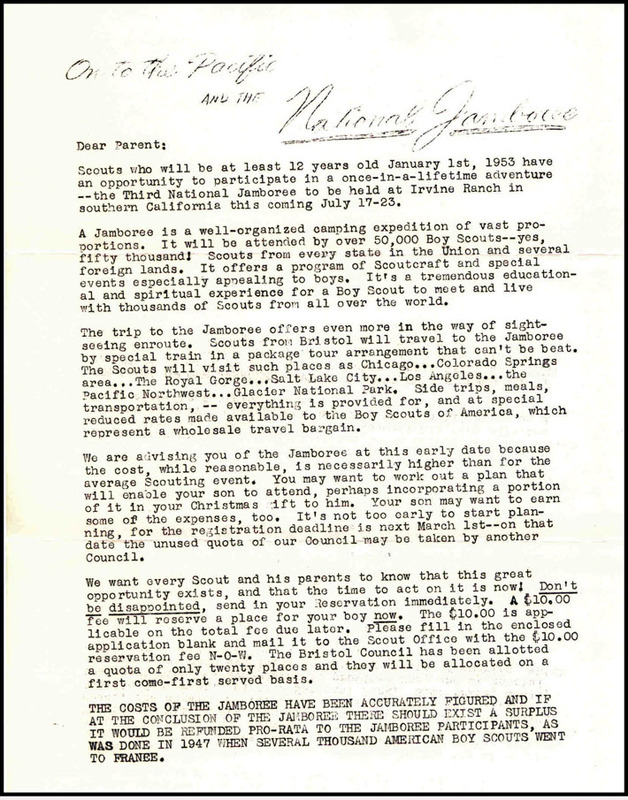 Refer to the 1952 Bristol Council cover 52-11 in Additions 1950s section. & tells what a first day cover is. The 4th side is 62FD-65b, the actual FDC. 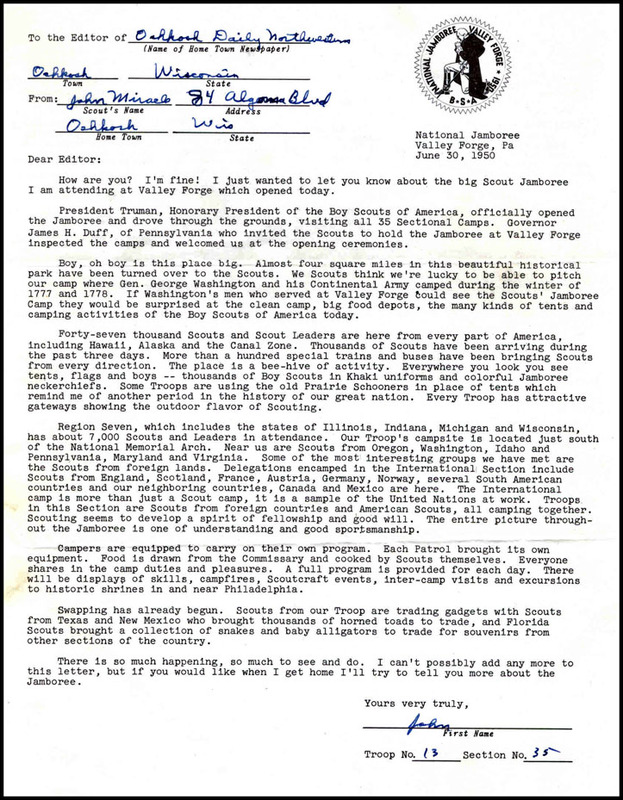 See it in Vol III 1962 GS FDCs.